Lord Surya is the sun god in Hinduism. Important scriptures and mythology associated with Hindu religion contains several depiction of Lord Surya riding seven horses. The seven horses are known as Harits. 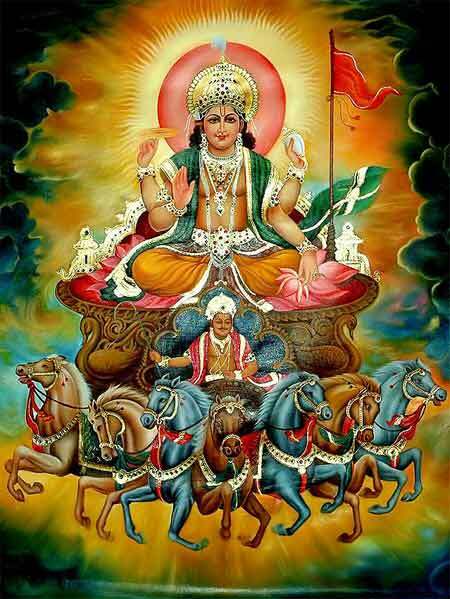 Ratha Saptami is an important festival dedicated to Lord Surya riding seven horses. In Hindu Mythology, Lord Surya rides across the heavens (sky) in a chariot drawn by seven horses. The horses symbolize the cosmic rays, which radiates warmth and life. As they move across the skies, they remove darkness and usher in light. The seven horses also symbolize the seven colors of rainbow. The reins of the horses are firmly in the hands of Aruna (Charioteer of Sun God). The reins are the seasons and Aruna makes sure with the reins that rays of the sun sustain all living beings. The seven horses are also said to represent the seven days of the week. The seven horses are often referred as Harits and sometimes instead of horses it is seven mares. Occasionally, they are also depicted as one horse or mare with seven heads.